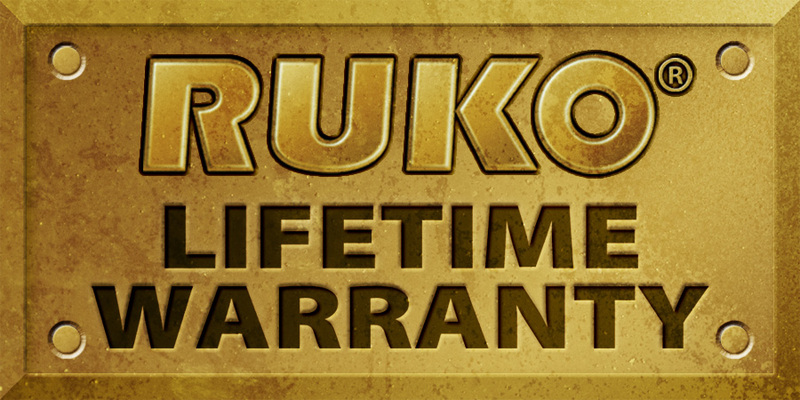 All RUKO® products are covered by a lifetime warranty against defects in materials or manufacturing to the original consumer purchaser. Defective products will be repaired or replaced with the same or substitute item of equal value at RUKO®'s sole discretion. This warranty does not cover transportation charges to RUKO®, loss, self-repair, bent or broken blades or damages due to misuse, abuse or lack of normal maintenance. In the case of a warranty claim where the merchandise value is UNDER $20.00 wholesale value - the following procedures must be followed for us to process the claim. Customer or Sales Representative must contact RUKO® for an RA# using the form provided on the RUKO website or via fax, phone or e-mail at info [at] rukoproducts [dot] com . Model of the defective product and detailed description of the defect must be provided in the above correspondence. An option to provide a clear photograph in .jpg, .bmp or .pdf format is made available on the Returns form. Note that "Broken" is not sufficient, details must be provided. "Broken Pocket Clip" or "Missing Screws" is required. In the case of defective sheaths or a defective component in a set (eg: RUK0131) - we will send a replacement at no charge. CREDIT for this type of defect will NOT be issued. Due to the nature of extended batons and throwing knives - this warranty only extends to the sheath and does not cover the baton or throwing knives themselves. We will issue a credit note for the defective item.